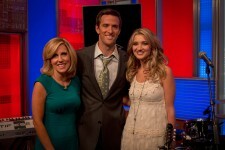 Sarah Darling Made Her Fox & Friends Debut This Past Weekend. Sarah Darling made her Fox & Friends debut this past Saturday, September 22. While there she gave a live performance of her new single, “Home To Me.” Following the broadcast, Darling performed “Old t-Shirt” on the after show. Click HERE to see “Old t-Shirt” and look below to see “Home To Me” and a picture of Darling, Alisyn Camerota and Dave Briggs. Find the most current Sarah Darling tour dates from our partners at Country Music On Tour, your trusted country concert ticket source! Country Music News Blog participates in advertising programs that help fund the operation of this site. For more information please visit our privacy statement. This entry was posted in Featured, News, Sarah Darling by HaleighT. Bookmark the permalink.